also, give Zombie Keys a try! SmartTemplate4 is the next generation of the popular Mozilla Thunderbird addon SmartTemplate. It offers an easy way to customize default quote header by using templates. Templates can be created for every account as well as for global settings (for all email accounts). 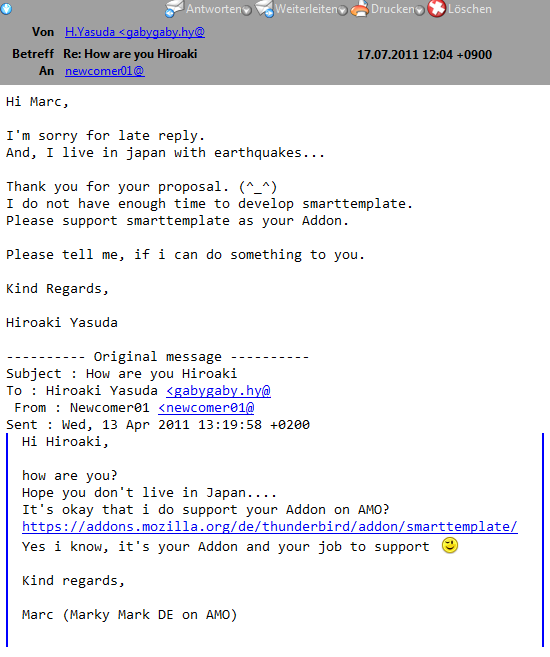 Development of the original SmartTemplate by gaby_hy (H. Yasuda) has been discontinued for time reasons. SmartTemplate4 builds on this original add-on with written friendly permission from the original author. SmartTemplate4 works with Thunderbird, SeaMonkey and Postbox, additional information to this you can find on our Version History. * This means that global settings and other Addons are not affected by its installation. Version 0.9.3 onwards do support the integration of Stationery Add-on for more power with HTML e-Mails! Would you like translate SmartTemplate4 into your own language? Please visit BabelZilla and start a new locale for your language. Would you like correct or complete your language? Please join the translation Team for your locale on BabelZilla.